Other images for the 30/30 are under the Watercolor tab as I am illustrating a book of poems to be published in December, 2013. Read more about it there. At the bottom of the page there are two flip books of images painted during the 30/30. 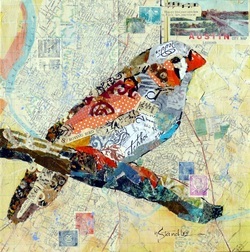 A torn paper collage with some hand painted papers on an old 1953 Austin city map, glazed with acrylic paint and a few vintage stamps used for accents. The old maps have streets circled and some notes on the edges and will be obsolete in a few years with all the GPS and smart devices telling us to "take the next right in 100 yards". 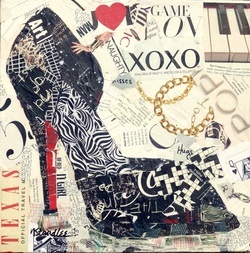 This collage is on a gallery wrapped canvas with 1 1/2" depth with the papers covering the sides and hanging devices are attached. No need for a frame. 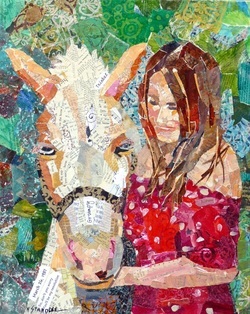 A torn paper collage with hand painted papers and some from an old Cinderella story book. 18x24 on gallery wrapped canvas. 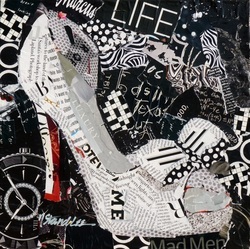 Torn paper collage high heel. For Day 9 on the 30/30. Hand painted blue papers for this collage with some Texas maps from 1960. Special to me as it is featured in an ArtByte collage tutorial I have on the Daily Paintworks site. 12x12 on gallery wrapped canvas. Day 13 of the 30/30 painting challenge. 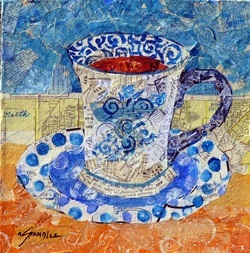 Hand painted and found papers on a torn paper collage glued to white business pages, glazed and text and vintage stamps added. See an ArtByte collage tutorial on the DPW site. 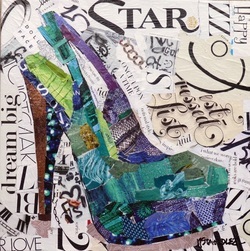 10" canvas torn paper collage and is available on my Daily Paintworks . Can be viewed in zoom on my Daily Paintworks gallery. 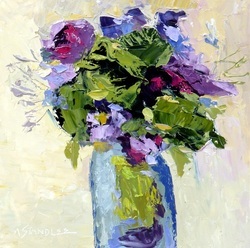 8x8" on Ampersand gessobord panel, available on Daily Paintworks. 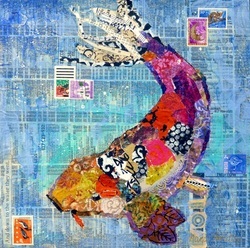 A torn paper collage with hand painted papers in complementary colors of blue and orange. 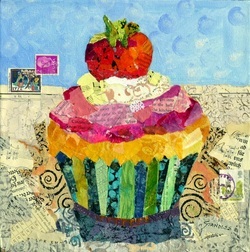 The painting is 12x12 with a 1 1/2 depth gallery wrapped canvas so no framing will be necessary. The sides are collaged and the paper painting is ready to hang. 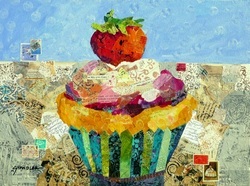 A torn paper and hand painted paper collage commission 20x16 on gallery wrapped canvas. For days 6, 7, and 8 for the 30/30. 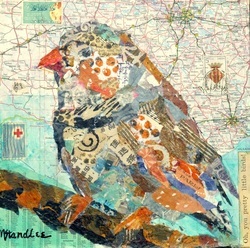 A combination of torn and hand painted paper for the collage and some stamps and maps. 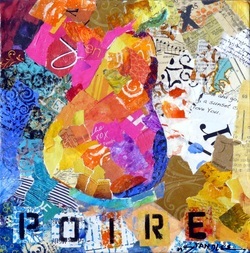 Hand painted papers for this torn paper collage with an acrylic paint foundation. 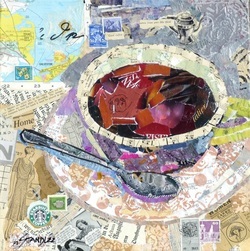 An ArtByte, affordable collage tutorial is available at DPW for a cup. Torn paper collage of magazine papers in black and white with red accents. ArtByte tutorial is available. See explanation above in heading. 8x8 in watersoluble oil on Ampersand Gessobord panel, painted in the Leslie Saeta workshop in Sandbridge, VA. 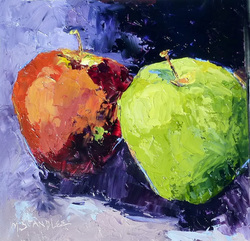 Available on Daily Paintworks gallery page.